On the evening of Nov. 16, a post in the University’s community-forum Facebook group, WesAdmits 2021, ignited a discussion about something other than misplaced IDs and iPhones. 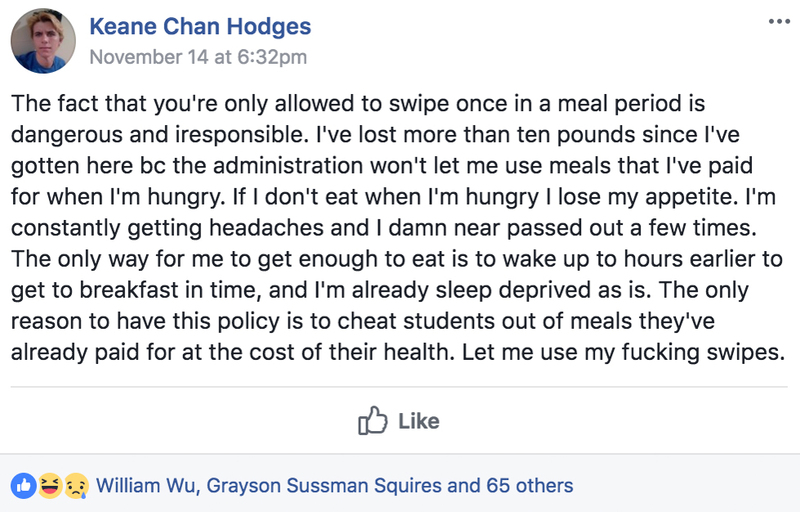 Authored by Keane Chan Hodges ’21, a freshman from Hawaii, the strongly worded post criticized the University for not allowing students to use more than one meal swipe per meal period at the Usdan Marketplace. Soon after the post went up, students began commenting with solutions to his problem. One student suggested that Keane keep their receipt and use it to get back into the dining hall after leaving the building. Another suggested that Keane bring a backpack with them to Usdan and take snacks and fruit for later. The post quickly garnered over 160 separate comments, many of them threads. Keane saw these comments as inadequate solutions to what they see as a larger problem with the University’s dining system. The FAQ page of the Dining at Wesleyan website, which is run by Bon Appétit, provides information about the rules on double swiping during one meal period. The page also highlights that after Thanksgiving in the fall semester and the first Monday of May in the spring semester, students can use multiple meal swipes during one meal period. In both an email and in-person interview, Keane spoke about their first few months at the University and the trouble they’ve had maintaining a healthy weight since arriving on campus. They spoke about their fast metabolism and how three meals a day isn’t enough to keep them feeling well. Since they have the meal plan with 285 meals and only 59 points, Keane has eaten most of their meals at Usdan Marketplace. Without the ability—that points provide—to eat throughout the day, they have resorted to eating to the point of feeling sick at each meal just to feel full for the rest of the day. This wasn’t enough to keep them feeling healthy, though. Keane has also tried going to the other dining establishments on campus, but they said that each time they went, the dining employees would either mess up their order, or they would get food poisoning. They started to get frustrated with the University’s dining operation over fall break when they were unaware that the dining halls would be closed during the four-day weekend. They have found inconsistencies in posted hours for campus eateries and felt stranded when they didn’t have access to food over the break. “The least [University dining] could do is foot the bill for groceries, given that they are actively preventing us from using meal swipes we already paid them for,” Keane said. Hoping to find others who were having the same problems, Keane posted in WesAdmits 2021, but they said that this post was not a solicitation of advice. When advice did start pouring in, Keane felt insulted by what they saw as students thinking they could solve a problem they had been dealing with for months with a quick comment. They were frustrated that commenters reiterated points that had been made earlier in the thread and posted solutions that Keane had already refuted. Keane saw the response to their post as indicative of the financial privilege of many University students. People also started making jokes about Keane’s situation in the comments. Reaction GIFs and memes flooded the comments section expressing the disbelief of some students who had never considered that not being able to swipe twice during a meal period could be a problem for some. “You might have a tapeworm…you should get that checked out,” one student joked. “Wait I’ve only gained weight since I’ve eaten at usdan….tips on how to be you?” another student wrote. Keane was unamused by these jokes. They spoke about how this interaction with the University community gave them a new understanding of its students and their supposedly liberal values. Justin Liew ’18 commented on the post when people criticizing Keane for rejecting the help that people were giving them. He defended Keane from what he saw as bullying. Rachel Williams ’19, who commented with suggestions of people and offices Keane could contact with these concerns, thought that the comment section got out of hand when Keane started shooting down every offer of help. Some students responded to the post and the discussion surrounding it with memes. 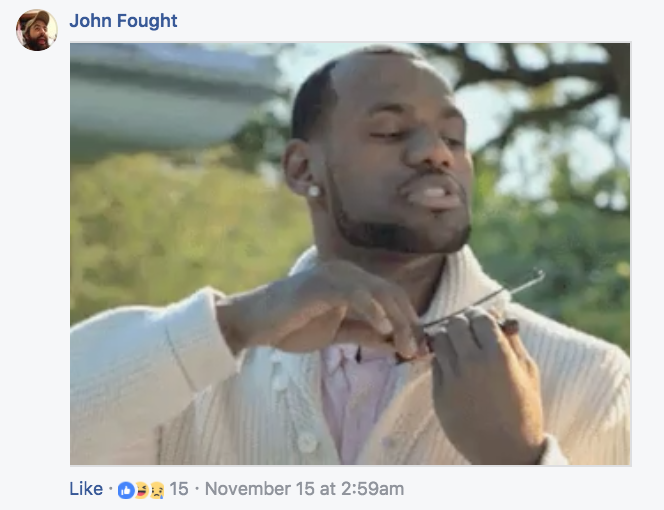 Gemmay Shay ’18 posted a meme on Soggy We$ Memes, a Facebook meme page serving the University community, that got over 30 likes in five minutes. Shay commented on how they came up with the meme. After a student commented on the meme saying that it was a form of bullying, an admin of Soggy We$ Memes took down the picture. 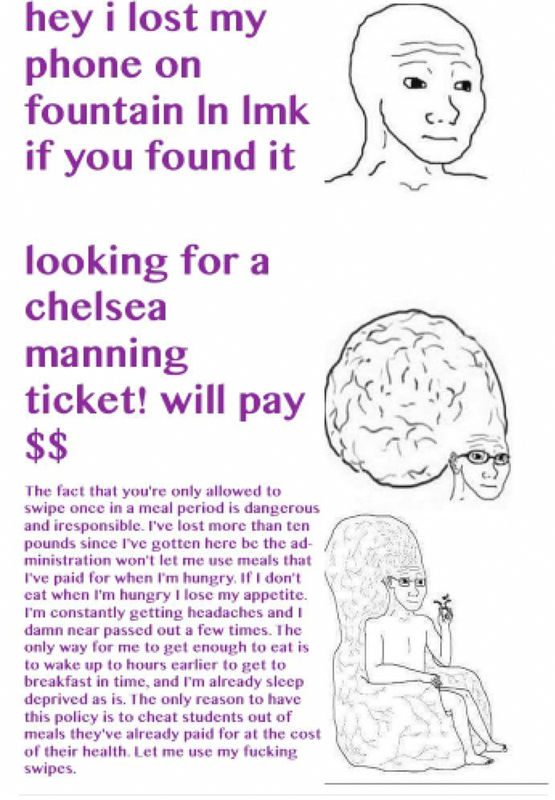 Shay reposted a “clean version” of the meme, with a warning against cyberbullying in place of the post’s text, and a student commented saying that Keane had seen the meme and wasn’t offended by it. Keane has said that they are currently able to use multiple swipes in one meal period during the weeks following Thanksgiving break. They plan to change their meal plan next semester to have more points. Keane has reached out to the administration with their concerns but has received little help. This experience, coupled with others they have had in their few months on campus, has tainted Keane’s view of Wesleyan.